Andrew and Haleigh’s transatlantic fairytale wedding at Highcliffe Castle in Hampshire. 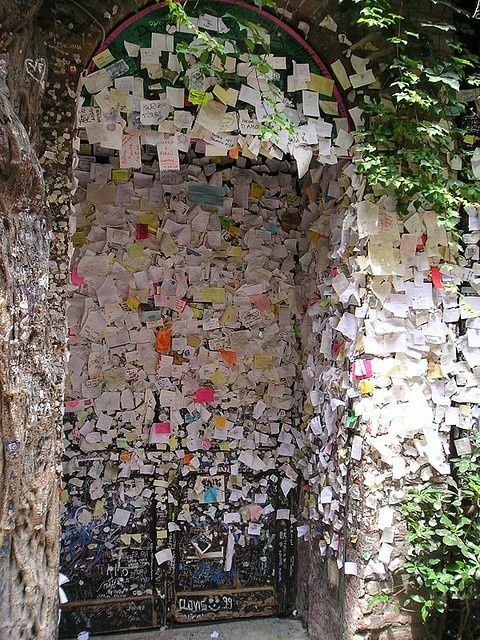 This photo of an abandoned castle in Sorrento really took my breath away…..
Verona… notes of love left at the entrance to the famous balcony featured in Romeo and Juliet. A beautiful series of photographs of the interiors and architecture in Cuba (2002). Beautiful architecture photography of gothic ceilings by David Stephenson. Porchet, who graduated from the consistently fantastic Swiss art school ECAL, began documenting Baroque churches a couple of years ago – initially concentrating on their exuberant altars before moving on to documenting their ceilings. Very ‘Margeliaeqsue’, all white, sterile, drapes, trompe-l’oeil wallpapers and custom furniture, the hotel ‘Maison Champs-Elysées’ commissioned Maison Martin Margiela to redesign, redecorate and reconcieve the hotel. Mathieu Lehanneur has converted the choir at St Hilaire church in Melle in the Deux-Sèvres department (France). After nearly two decades of having only bats, rats and the occasional tramp as inhabitants, the former Midland Grand Hotel beside London’s St Pancras station is at last about to open its doors to paying guests.